When I first met my husband I never ate dessert. This was a foreign to my husband. He always ends a meal with dessert. Always. He couldn’t understand how I couldn’t have dessert after dinner. Thinking back on it, I realize that’s just, well… crazy. I don’t have dessert after every meal, not even after every dinner, but now I do appreciate a good dessert to end a meal. Especially when I have company over for dinner or I’m taking dessert to a family or friends get-together. Because having a delicious dessert is the perfect ending to any meal. I like making homemade desserts from scratch, but quite frankly, I don’t always have the time. Thanks to Private Selection… I can run to Kroger and pick up a Private Selection Upside Down Cake. And if I take one of the Private Selection Upside Down Cakes to a pot-luck dinner or picnic, everyone is happy to have a delicious gourmet dessert and I get all the credit. Not that I would ever do that. Now if someone assumes I made it, well, I can’t help that, now can I? Private Selection Upside Down Cakes are so easy – just warm, flip and serve. Private Selection Upside Down Cakes are premium quality without the premium price and taste like homemade, thanks to only using the best ingredients. Kroger is spreading the love with their “Spread the Love” campaign by offering coupons for their Upside Down Cakes. You can get a $1 off now or share it on Facebook and get $2 off… all the more reason to like Private Selection Upside Down Cakes on Facebook. It ends on June 2, 2013, so be sure to get your Private Selection Upside Down Cakes coupon. You can follow Private Selection Upside Down Cakes on Pinterest, too, for more great serving ideas. Disclaimer: Coupon ends 6/2/13. Official Rules. In order to load these coupons to your card, you will need to sign into your Kroger account or set up a Kroger account and enter your card number. Limit one use per digital coupon. Digital offers are not eligible on Manager’s Specials, cannot be combined with manufacturer paper coupons on the purchase of a single item, and do not double. Not all items are available in all stores. A limit of 150 coupons can be loaded per household at one time. You can find a Kroger store carrying Private Selection Upside Down cakes nearest you here – http://www.privateselection.com/store-locator/. That upside down cake looks so yummy! I’m gonna have to try the Double Chocolate Molten Upside Down Cake for sure! I’m sooo willing to do an extra mile on the treadmill for that one :)! I love shopping at Kroger and their Private Selection brand has some good stuff. My husband is picky about brand names but he likes theirs. Thanks for telling us about these delicious desserts! This looks absolutely delicious!! I have a big sweet tooth. My family & I are too like your husband and have always had our dessert after dinner. This will be an easy one to prepare and the best part we all love chocolate!! Thanks for the new recipe. 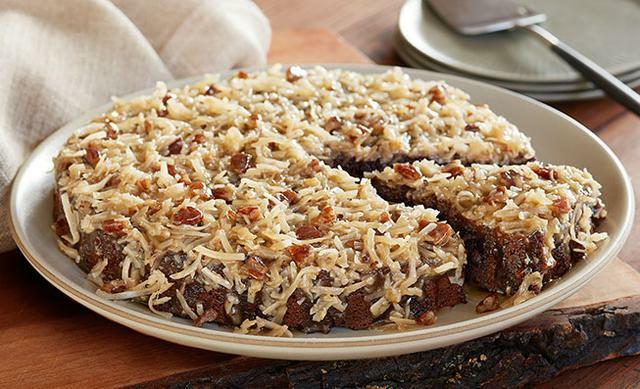 I love a good German chocolate cake. And I think your hubby has it absolutely right. A meal is ALWAYS better with dessert. I’d like to try the Double Chocolate Molten Upside Down Cake, but they all sound wonderful. Makes me wish I lived by a Kroger store again. If they had a diabetic sugar-free cake like that I would be in Heaven! That would be nice, Nadine! I’m kinda wanting that double chocolate molten one! I’d love to try the Double Chocolate Molten Upside Down Cake! We don’t live near a Kroger right now, but I keep seeing these on blogs and when we move to TX and have a Kroger to shop at, I’m so trying one of them out! I like upside down cakes, my mom used to make a killer pineapple one. Holy smokes that looks amazing. I am seriously now craving this! It looks yummy – I think I just gained a pound. They all sound so good that I wouldn’t know which cake to try first! I hardly have dessert, unless it’s something I eat first. Otherwise, I get full from the meal since I get full easily. Oh.my.yum. I want that now please. Oh, wow. Yum! And I have a Kroger down the street. I wish we had a Kroger, those cakes sound delicious! I love having dessert but try not to eat it every day!